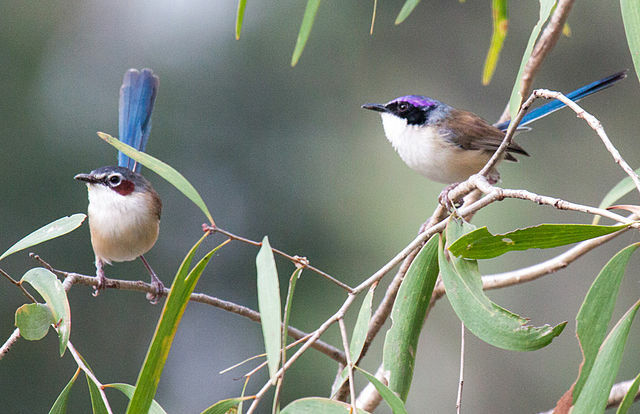 We are looking for volunteer field assistants to assist with data collection for research on dispersal and helping behaviour in purple-crowned fairy-wrens. Our study population is located in the Kimberley, Western Australia. Fieldwork will take place during and after the wet season, when most of the birds are breeding. We are seeking volunteer field assistants to help monitor all fairy-wren territories along a 15 km stretch of river. Work will involve re-sighting colour-banded birds, nest searching, monitoring all breeding attempts, placement and upkeep of nest cameras, assessing nest camera footage, assisting in behavioural and ecological field experiments, mist netting and data entry. The field site is located at a remote sanctuary an 8-hour drive from Broome, WA. Volunteers will be camping in tents but have access to electricity, a landline phone, (restricted) internet, hot showers, and a very spacious fully equipped kitchen, which is shared with the rest of the (usually small) community at the field station. The field site is located in a beautiful area, with many opportunities to see native wildlife and some of the most iconic bird species of Australia, and many waterholes and gorges which volunteers may get the opportunity to explore. Volunteer field assistants must have full colour-vision, be physically fit, be flexible and willing to work long days in hot and humid conditions while encountering the occasional snake, be comfortable with living in a remote location, have good interpersonal skills, and be able to work independently in the field. It is important for volunteers to be accurate when collecting and entering data, and to ask for help when unsure about anything. Previous experience in similar conditions and with nest searching and colour-band re-sighting is required; experience with behavioural observations and mist netting is a bonus. Fieldwork will commence late December 2016/early January 2017 and run for approximately 6 months, until mid-June. A commitment for the full period is preferred, a minimum commitment of 3 months is required. The cost of accommodation (camping in tents) and local travel expenses (to/from Broome and around the field site) will be covered. Flights to and from Broome and/or food expenses may additionally be covered depending on level of experience and duration of stay. For further information and to apply, please send a CV, cover letter and contacts for at least two references that are familiar with your nest searching and colour-band re-sighting experience to Niki Teunissen: niki.teunissen@monash.edu. Applications received by 25 September will be fully considered.